The global water and wastewater pipes market presents several lucrative opportunities to both seasoned players as well as new market entrants. To provide highlights on these opportunities as well as to study the various facets of this market, Persistence Market Research recently undertook an extensive study of the global water and wastewater pipes market and presented the findings in a new report titled “Water and Wastewater Pipes Market: Global Industry Analysis (2012 – 2016) and Forecast (2017 – 2025).” In this report, we have focused on the detailed market segmentation and historical as well as current and projected market forecast of the global water and wastewater pipes market, to present our readers with in-depth market information and useful insights. In computing the global and regional volume projections and revenue estimations of the water and wastewater pipes market, we have deployed a systematic and multi-pronged research approach that extensively leverages primary and secondary research to arrive at the key data points pertaining to the global water and wastewater pipes market. In-depth secondary research is used to arrive at the overall market size, top industry players, top products, industry associations, etc. A list of industry players (manufacturers), distributors, retailers, and industry experts is developed along with a comprehensive discussion guide for detailed and exhaustive primary interviews. Data thus obtained is validated using the triangulation method, where primary and secondary research along with Persistence Market Research analysis contribute to the final data. This data is then scrutinized using advanced tools to glean pertinent insights into the global water and wastewater pipes market. While water and wastewater pipes can be manufactured using different types of material such as concrete, steel, ductile iron, and clay, plastic seems to be the most preferred material type widely used by manufacturers in the global water and wastewater pipes market. This probably explains why the Plastic segment is predicted to be the largest and most dominant segment in the global water and wastewater pipes market throughout the forecast period. In terms of both value and volume, plastic pipes are expected to hold a majority share in the global market. According to Persistence Market Research forecasts, the Plastic segment will hold a large value share of more than 55% by the end of the forecast period in 2025, up from an estimated 54% in 2017 – witnessing an increase of 290 basis points in its market share in 2025 over 2017. The main reason for an increase in market demand for plastic pipes is owing to the fact that plastic pipes are lightweight and are also not subject to corrosion on coming in contact with water. The Plastic segment is estimated to be valued at about US$ 13 Bn in 2017 and this is expected to increase to just under US$ 23 Bn by the end of 2025, registering a CAGR of 7.1% during the forecast period. The Plastic segment is projected to create total incremental opportunity worth US$ 8,844.7 Mn between 2017 and 2025, which is 60% of the total incremental $ opportunity generated over the forecast period. The Plastic segment will generate incremental $ opportunity worth US$ 1 Bn per annum post 2020. Steel is the next largest segment by material type in the global water and wastewater pipes market, with an estimated market share of 17.5% by the end of 2025. In terms of volume, the Steel segment is pegged at 9,215 KT in 2017 and this is anticipated to increase to 12,860 KT by the end of 2025, witnessing a CAGR of 4.3% over the forecast period. The Steel segment is projected to create total incremental opportunity worth US$ 2,336.9 Mn between 2017 and 2025. The Concrete segment is expected to maintain steady growth throughout the forecast period and create total incremental opportunity worth US$ 1,578.5 Mn between 2017 and 2025. 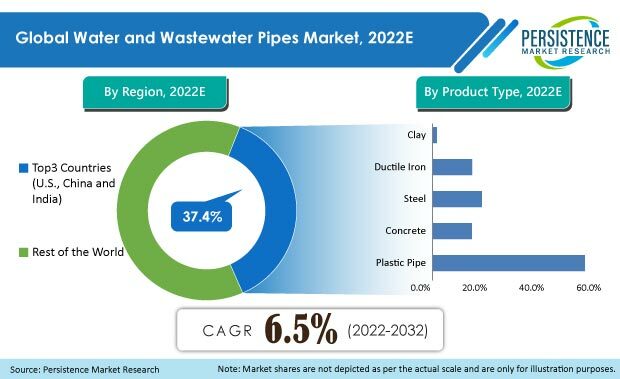 In terms of material type, the global water and wastewater pipes market will be ruled by the Plastic segment throughout the forecast period, which is likely to be a high value, high growth segment through 2025. Plastic is increasingly being preferred as a suitable material type to manufacture water and wastewater pipes owing to its inherent features such as corrosion and abrasion resistance, high durability against dynamic pressure and climatic conditions, and affordable pricing. Further, new developments in plastic manufacturing to enhance the above qualities of the material are also contributing to growing demand for plastic in the global water and wastewater pipes market. Among the different types of plastic used to manufacture water and wastewater pipes, HDPE is anticipated to witness high market demand, owing to its superior performance characteristics, low VOC emission levels, and a high degree of flexibility. The Concrete segment is poised for good growth towards the end of the forecast period owing to increasing demand for large diameter pipes in civic infrastructure and construction project activities. Likewise, revenue growth of the Steel and Ductile Iron material type segments is anticipated to expand over the forecast period, owing to significant demand from the industrial sector. A growing demand for steel pipes in the as oil & gas industry for exploration, drilling, and transportation applications is expected to boost the growth of the Steel segment in the global water and wastewater pipes market.